Nick Foles guided the drive of a lifetime, Zach Ertz made a bobbling touchdown catch that had to survive replay review, and an exhausted defense came up with not one but two stands in the final moments Sunday for a 41-33 victory. 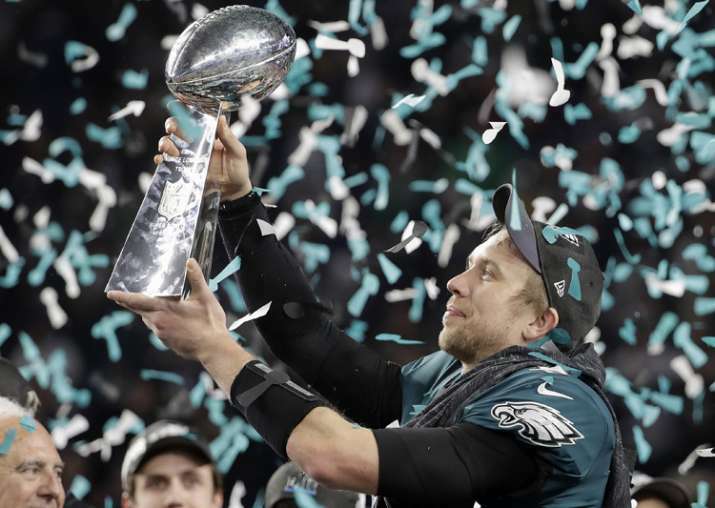 Image Source : AP IMAGE Philadelphia Eagles' Nick Foles holds up the Vince Lombardi Trophy after the NFL Super Bowl 52 football game against the New England Patriots. As their delirious fans sang their theme song and their owner lifted the Lombardi Trophy, the Philadelphia Eagles' finally could breathe freely. "We've played this game since we were little kids, we dreamed about this moment," game MVP Foles said. "There's plenty of kids watching this game right now dreaming about this moment and someday will be here." The touchdown stood - and so did thousands of green-clad Eagles fans who weren't going to mind the frigid conditions outside US Bank Stadium once they headed out to celebrate. But not before a rousing rendition of "Fly Eagles Fly" reverberated throughout the stands once the trophy was presented to Lurie. Later, fans danced along with the "Gonna Fly Now," the theme from "Rocky," the city's best-known fictional underdog. Then Foles made them forget Wentz - and least for now - with the gutsiest drive of his life. Gronkowski, who has played eight superb but injury-riddled years, said "I am definitely going to look at my future." When all the Eagles could manage was Elliott's 42-yarder for a 32-26 lead, it seemed inevitable the Patriots would go in front, then become the first repeat Super Bowl winner since they did it in the 2004 and '05 games. Foles, Ertz, and - at last - a revitalized defense said otherwise. But the Eagles still had 2:04 left in the half - and some more magic in their bag. Each team started with 67-yard drives to field goals - New England had never scored a first-quarter point with Brady in a Super Bowl.